One of my client spends quite a bit of their advertising dollar on Google Adwords. They aggressively test new keywords on a weekly basis for their business. I can stress it enough, if you are adding a lot of new keywords it's very important to have a good process in place to regularly conduct your negative keyword optimization to maintain a healthy return on investments on your Ads. One of the key requirements of such a company spending majority of their advertising budget on search is the ability to put checks in place and treat every optimization task as a process that can be improved over time to get most out of it. We had established a manual process for their negative keyword optimization that we do on a weekly basis. The process is very similar to how most advertisers would conduct their own negative keyword optimization. If you are a newbie I took the liberty of showing how we do it. We establish the process around utilizing the search query terms report provided by Google. The manual process looks like this. 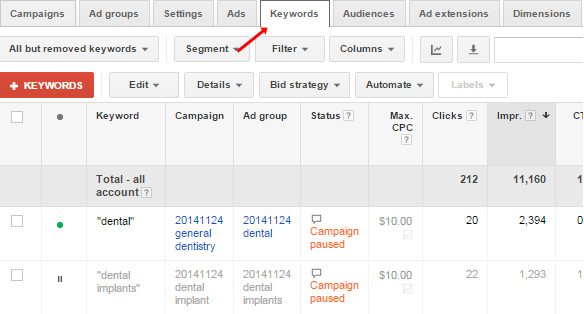 Step 1: Log on to your adwords account. Step 2: Set the account's reporting dates to Last Week. Step 3: Go to the keywords tab, select the details button and run the Search Terms Report for All keywords. 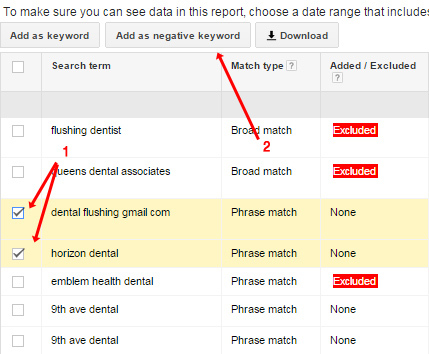 Step 5: Search Terms Report shows keywords. 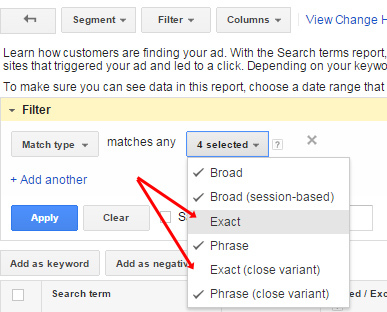 Step 6: Now since my clients are not too concerned about exact and exact close variant keywords, you would set the filter to exclude all exact and exact close variant keywords. They only want to work on the negative keywords for phrase and broad match terms and all it's close variations. 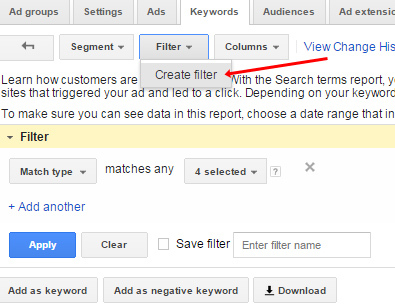 change the filter to match types and deselect exact and exact variant, then click apply. Step 7: Now the actual optimization starts here, at this step you would now identify all the keywords that you'd like to add as negative keywords. 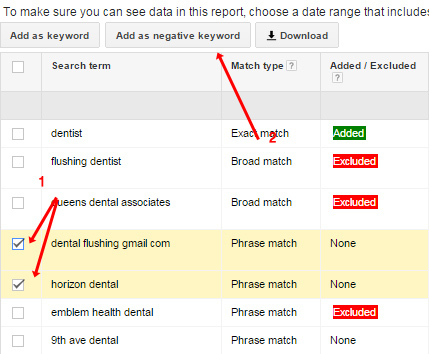 Step 9: At this step you now need to decide what negative keyword match types you'd like to add to the account. Sometimes, a negative exact match is sufficient which is what Google want you to do to restrict fewer keywords, but sometimes you'd like to change everything to negative phrase match or even change the keyword and then use a negative broad match to cover more cases. The current screens as you can see if you want to add dozens of keywords becomes very tedious, you would select the keywords and change the keyword and it's match type one at a time. This is were most time is spent on this entire negative keyword optimization process. Step 10: After editing all the negative keyword match types that's when you click save so the negative keywords are added to your account and you just completed your negative keyword optimization on the account. Our clients are finding themselves performing this negative keyword optimization process in the range of 2 to 4 hours a week, if they were to do it right. Now, the question came up is there a better way of doing this? And as they grow, they also want a historical account of what was done to the account, granted that it's possible to get that information in the history section of Google Adwords, they'd like to see a history of just the negative keyword optimization, like an audit trail if you must to see what was done in the past. The main goal is to reduce the time conducting the negative keyword optimization. 1. it's easier if we can utilize google spreadsheets to do this optimization, it's always easier to work on a spreadsheet. 2. historical account of what was added as a negative keyword is a really good plus. 3. reduce the time conducting the negative optimization process, target was spend only 50% of 2 to 4 hours a week to do the optimization without compromising quality. After careful analysis of what is possible with Google Adwords scripts and what their requirements are we came up with our first version of Negative Keyword Optimization System. Here's how you would use the adwords script to help you with your negative keyword optimization process. something you do once. The script can be scheduled weekly or monthly depending on how often you want to do your negative optimization. The goal of the script is to extract all the keywords that are candidate for negative keywords optimization and save it on a spreadsheet, the manager will then go to the spreadsheet and mark things to be added as a negative keyword, specify where it'll be added a campaign or an adgroup and also the negative match type of the keyword. So here are the high level steps of this semi-automated process. Step 1 (automated) - the script will identify and extract all the keywords you want to optimize, most of the time you would exclude exact match, you can configure this in the configuration spreadsheet. The keywords will be extracted into your spreadsheet every week or every month. Step 2 (manual process, you) - open the spreadsheet, mark the keywords you want to add as negative keywords with a 'y', if you have 10 keywords to add you just pick them by adding the 'y' beside the keyword you'd like to add as a negative keyword and and you're done. 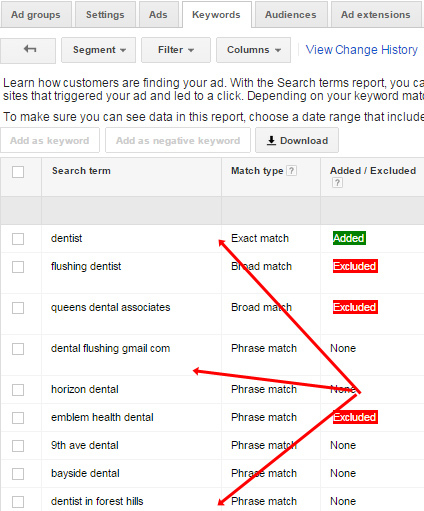 If you desire to change keywords you can do that right on the query column, you can also change the match type if you want to do that as well. Step 3 (automated) - the next time the script runs, it'll pick up whatever you mark as 'y' and add them to your adwords account after which it'll mark as 'y-processed'. After it adds all the negative keywords, it'll redo Step 1. You go through the same process every week. Granted that there is a 1 week delay this is typically ok. However, if it's not ok with you, you can configure the to script run twice a week if you prefer. Once to extract the keywords and the second time to add the negative keywords and schedule the extraction first and then the addition second, maybe 1 or 2 days apart to give you enough time to mark the keywords you'd like to add, you can also trigger the addition of the negative keywords process manually if you so choose to. What is the final result for this? Our client was very happy with the improve speed, so they don't spent 2 to 3 hours any more to do all these negative keyword optimization. It's now down to less than 10 mins in the many cases under 5. Now this script is not for everyone but consider how you do your negative keyword optimization if saving 1 to 2 hours a week or 1 to 2 hours a month is totally worth it, then I urge you to give this script a try after all it's free! Subscribe to our Newsletter and get this script for free, you'll also receive other free scripts in the future that will only be announced in our newsletter. Click the button Get My Script Now.